Set in a very Spanish community, in beautifully maintained, mature tropical gardens with a large pool. Private patio offers some shade under a flowering pergola, there is also a secluded front garden with a seating area. Two families can easily share as the house has 3 air-conditioned bedrooms upstairs (sleeping 5) and a spacious comfortable basement conversion (sleeps 4) with own bathroom, own air-conditioning & TV. Separate Central Heating for the winter in all the house. Good Wi-Fi connection; upstairs rooms have small terraces with sea views. Equipped with all "creature comforts", including washing machine, dishwasher, microwave oven, electric kettle, toaster, food processor, fire place, barbecue. Located very near beach (3 min walk), all amenities, beach promenade, bars, restaurants, shops; water sports on a beach within easy walk. 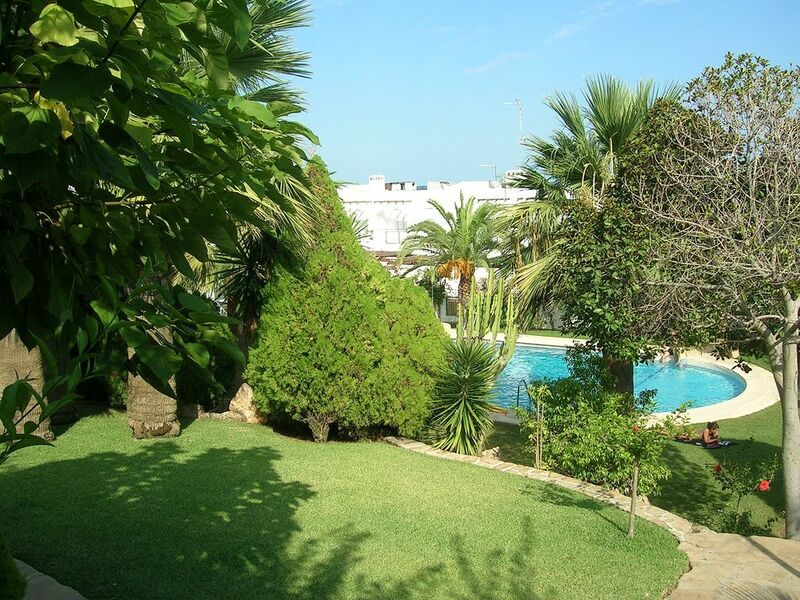 Historic town Mojacar Pueblo within 2 miles, Aqua Park within 10 miles, near golf course. A choice of easily accessible local points of interest. We fell in love with Mojacar long time ago and invested a lot of effort in finding this place that we cherish and enjoy with family and friends whenever we can. We care about Mojacar, we like the fact that there are building restrictions that don't allow any high rise construction to spoil the area. We care about nature, I love plants and flowers, they make the place feel like a tropical oasis. Our house and the whole community, is well looked after. We made our place as comfortable as possible, we like our comforts, especially on holidays! We always wanted a place in Spain as close to the sea as possible, with a nice pool, where you could enjoy long walks without needing a car, easy to reach (airports/transfers), and one that was still very "Spanish", not totally taken over by tourists but full of character. We didn't want to contribute to the massive over development of the coast and so wanted a house that was already there, set amongst lush & mature tropical gardens, a place that had real Andalusian flair. We wanted to enjoy the sun, but also to have a cooling shade on the terrace, we wanted to have it really comfortable too! We researched a lot to find such a place that ticked all the boxes, and were so lucky to find it! We spend all our holidays here and offer it to rent at other times for others to enjoy. From our house you can still go to places that are unspoiled, through stretches of the coast (towards Carboneras) where you can enjoy the pristine beauty of the coastal Natural Park landscape. It is unfortunate that the Spanish coast has been so overdeveloped, but Mojacar and surrounding areas retain a lot of its original character and beauty, whilst Mojacar Pueblo is a real vibrant town celebrating its traditions, "fiestas", music and song. You have it all here: you can stay in the house, enjoying the pool and the sea, no need for a car to get around to local bars, restaurants, shops. But there is also plenty to explore - the mountains, traditional fishing villages (Agua Amarga), as well as the attractions of Vera Water Amusement Park, Mini Hollywood or even Grenada (2 hours drive away). Sierra Nevada offers glacier slopes open until end of April within 2.5 hours drive. You can skii late morning and dive in the pool in the afternoon. Marina Golf on Mojacar Playa (18 hole); Valle del Este and famous Desert Springs, designed by Ramon Espinosa, within a short drive (20 min) Superb views with the sea on one side and crops growing on the other, giving it own personality. Nine holes can be played on the flat area near the beach, the other nine holes are played near the mountains with different views and a different climate. Spectacular tees from some holes with excellent fairways, including 3 lakes. There are 5 pay & play golf clubs nearby. 9 hole Cortijo Grande is 20 min drive away at the foot of Sierra Cabrera. La Envia: 1 hour drive. Notes on accommodation: Wi-fi communal internet available. House is easy to share for two families as there is a separate downstairs conversion with on-suite bathroom. Air conditioning in all bedrooms, including the basement conversion. Also separate modern Central Heating system in the house - ideal for the winter months. Outside: The property features a secluded private front garden, surrounded by flowerinig plants, with a coffee table and chairs, plus a private rear patio, partially shaded with a flowering pergola, with table and chairs. This very Spanish community has beautifully maintained mature tropical gardens, grass areas for seating shaded by palm trees; communal swimming pool, lit at night. Utility Room: In the basement: washing machine, iron + ironing board, vacuum cleaner. Cleaning / Towels / Linen / Maid service: Bath and hand towels and linen are provided; mid-stay cleaning can be arranged on request. Property is cleaned for your arrival, additional linen provided on 3 weeks rentals. Other: Professionally converted spacious basement (with small windows) will accommodate a family of four (1 double bed + bunk beds), en-suite bathroom with shower/WC, this room also has Air-Con, TV. Central Heating installed in all the house - ideal in winter. We have stayed here before so we knew what to expect. The complex is really safe for children as the only access to the gardens and swimming pool is through the town houses. We arrived on an early flight but were able to talk with the management agent. She came a short while later after we had eaten and met us in the local tapas bar and completed formalities before gaining entry. Luckily we came for our HoIiday during a really hot spell, thank goodness for air conditioning, the units in the bedrooms helped cool everyone down in the evenings and the main room one kept us all sane! There are a table and chairs on the terrace where we had some pleasant meals and which was only a few steps away from the gardens. One of the major plus points of this property is that it is literally only a hop skip and a jump away from the community swimming pool. We had a 7 and a 4 year old spending most of their time in the pool. It improved their confidence no end. We used a shuttle bus from Almeria airport which was excellent ( exclusive airport shuttles ). Pick up and drop off was right outside the supermarket. Had a lovely time and the villa was as expected and nice and quiet as off season but still plenty of bars and restaurants nearby and sea only 100 yards away. Only comments I would add are that the beds need replacing with sprung divans as not comfortable, and we would have appreciated a basic welcoming pack (tea, coffee, salt, milk, water) as if arrived later then nothing in the villa at all! Also I thought the hire of a cot and high chair at 20 euros each item for the week was not on. Apart from these we had a great time and very clean and comfortable with super gardens , shared pool and terrace. Pleased to hear you had a great time! I will take the point on a welcome pack for the future! And will investigate the beds. The cot and high chair rental are from a third party so I can’t do much about it. I do appreciate however all your comments! A lovely home in a superb location. We so enjoyed our stay in this lovely house, well appointed, beautiful gardens, and pool. Add to this that the beach & dozens of bars & restaurants are only a few minutes walk away, it was just perfect for us. We stayed at this lovely villa for four weeks this October (2014). The complex is absolutely beautiful, the gardens and plants are amazing and the pool area quiet and relaxing. The accommodation itself exceeded our expectations. The basement conversion is very tastefully done and the rest of the accommodation has everything you could possibly need, a real home from home. Our grown up children came out with their partners for a week and they absolutely loved the house and the complex and of course Mojacar. We have been regular visitors to the area for about 15 years now and can honestly say this is the best place we have ever stayed. In fact I have already booked it again for next October. Plenty of golf courses nearby, great restaurants, reasonable prices and a beach that goes on forever. Mojacar Village, set back about half a mile from the beach, is enchanting and there are too many beautiful and interesting places nearby to mention. The agents that deal with house are extremely helpful and easily contactable is you need them. Loved everything about it, can't wait to go back. This was our first time in Spain and the experience was overwhelmingly positive. This property was perfect for our family and we enjoyed the pool, the beach and the general atmosphere of Majocar Playa. Comfortable, well-positioned accommodation made it a perfect holiday for everyone. Would definitely plan to go again. I am very pleased you enjoyed your stay and will always welcome your family again! I have just returned from a lovely fortnight staying at this property. the house was beautifully clean, spacious, had air conditioning in all the bedrooms and was set in well maintained shared gardens with a very clean large swimming pool. it is a 5 minute walk from the beach and supermarket with plenty of restaurants close by. It is set in the quieter end of Mojacar and appears to be a very popular destination for Spanish families. We had some problems with a group of noisy French 20somethings in the house next door however the key holders 'Agent Mojacar' were very helpful and dealt with them. We often found that we had the pool and gardens to ourselves for a couple of hours in the afternoon whilst the Spanish holiday makers/residents had their siestas. The price of food and drink very reasonable and there was a super choice of places to eat. Glad you liked it and pleased to hear you found the agent helpful. Hope to see you again in Mojacar for another super family holiday! This community is located less than 100 yards (3-5 min walk) to the beach and the promenade. Walking along the promenade you will find a number of sandy beaches with excellent access to water, sun shades, beach bars/restaurants. Water sports are available on a beach within walking distance (10 minutes walk). There are some beautiful wild beaches (some rocky, some sandy beaches) a short drive away (10-15 min drive). Nearest airport: Almeria - 50 minutes by car (taxi transfer possible). Murcia is 1.5 h away. Alicante: 2.5 h drive away. Flights daily. Mojacar Pueblo, historical moorish town: 2.5 km inland, 10 min by car or local bus, or by bike, or walking on the pedestrian promenade. Garrucha, nearest fishing village: 10 min drive. Carboneras - on the edge of Cabo de Gata nature reserve - 30 min drive on scenic routes. Water Park in Vera: 15 min drive. Cabrera mountain, overlooking Cortijo golf course valley, 20 min drive. Caves of Sorbas: 40 min drive. Mini Hollywood (Spaghetti Western locations): 40 min drive away. A mini super-market is only 100 m away open 7 day week. Various restaurants, beach bars and shops within easy walk. Pleasant leafy Commercial Park Mojacar, with places to shop and dine, is around 1.5 mile away and includes a doctor's surgery and a notary. Pueblo Indalo (5-10 min walk away) features open air concerts & theatre in the summer. Booking Notes: 25% non-returnable deposit (minimum of £100) required before your booking is seen as definite: cheques, bank transfer or PayPal within 3 days after your enquiry to secure your booking, with the balance to be paid 12 weeks before your holiday. Credit card details taken at the start of the holiday to guarantee in case of any breakage. Admin booking form and Full Terms and Conditions will be sent on inquiry by email. Changeover Day: No fixed change-over days as flights arrive daily. Arrival: from 3 pm, departure: by 10am to allow for cleaning, but can be flexible depending on availability. Notes on prices: Please note that we may adjust pricing depending on the number of people renting. Long-let also considered for the autumn/winter months.